@ Server / Client / Env. Some things still TODO (see commit msg), but most of them are done. Exits before fatal errors are printed. This shows the error directly in terminal. 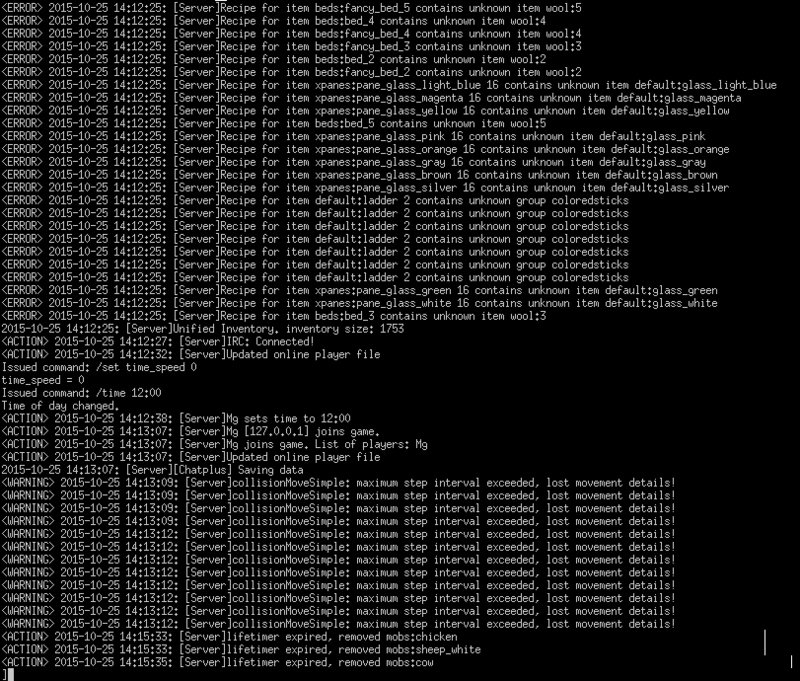 debug.txt remains completely unimpaired, and logs everything. As it uses the same console like the well known f10 console, it can scroll back within its own buffer, and has a command history available with the arrow keys. still WIP in many parts, but got tired of its life as separate branch. print is logged to debug.txt afaik. Nope, print isn't logged to debug.txt right now. Perhaps it was before the logging PR, but not now. Right now it seems that print directly outputs to stdout, which leads the console to "freak out"; e.g. you won't see your own input anymore. Therefore this is needed. Being able to see the output of commands would be helpful. return true, "Hi from return value"
/status returned nothing when I tried it. /time 12000 did not return a "Time set to 12000" message, only a log entry. This should use (int)LL_ERROR or similar instead of hard coding it's current integer equivalent. Why the unix timestamp? This is unreadable. Use getTimestamp() or just don't show a timestamp. What?? Why is the envlock here of all places? Well, we don't know here whether envlock needs to be set, so we assume we need it for handleAdminChat. Now I could lock the environment inside handleAdminChat as instead, but then I would have to modify how the environment is locked for the regular chat, where the environment is locked in Server::ProcessData. Removing it from there isn't preferrable. Now I could move the locking of the mutex into the while loop, or even into the if case. It wouldn't make much sense however, as 99% of the events received from the admin chat interface are chat messages (the other type can be nick informs, but they only happen at startup). And locking unlocking then locking again isn't surely something good performace wise. One optimisation I could do is to move the lock into an if case that checks whether there are elements in the queue at all. Ah okay nevermind, I see what's going on. Instead of locking environment, use a queue like i do in my own branch, transmit the message to it and read it from server thread . Envlock could be removed and you only need a mutex on the queue. That's precisely what's happening @nerzhul . The console runs in the console thread, it sends the chat over to the server thread via a queue. The server thread then locks the environment to process the chat. These ifs can be combined. You are right, I'll remove it. I am getting a segfault here (with m_admin_chat == NULL). I think this should be inside the if block. printw("[ESC] Toogle ESC mode |"
Backspace doesn't work for me. Fixed by adding "case 127" after "case KEY_BACKSPACE". As discussed in IRC, apparently on some systems the tinfo library needs to be linked as well, else there will be undefined references during linking. Also it would be nice if non-ncurses curses libraries were supported. I wrote a patch that makes cmake first check for ncursesw (and tinfo); if that fails, it uses FindCurses.cmake (shipped with CMake, also checks for tinfo) to find any other curses implementation. Okay, rebased and squashed. @kahrl has +1ed this PR from IRC, but he wants @BlockMen to try a windows build first. If you start a standalone server, it doesn't find the world from the passed name. Broken if --terminal is used or not. If you create a server from the main menu's server tab, and the account is new, you can't log in. @est31 Yeah, I didn't review the auth part much. Did someone else review that? @kahrl in place build? I had a non-in-place build. with a consistent name to their players. Okay, it seems that the first bug was wrong usage by me, and not a bug at all. It's the same way in master as well. The second bug has been solved by not giving the admin any privs until they have protected their account with a password. This especially means no messing with the builtin auth handler anymore. The other alternative would have been to tell auth handler code about whether we have an ncurses console running, or the server is started from the server tab. I am sorry, but what reasons to include this in the core? Could this be a side project, couldn't it? We may have simple lua mod that reads commands from some file or socket and executes them; on the other hand, regular server's stdout may be used to see results of the executed actions. I. e. there is a simpler implementation with the same functionality. It's been done before, but it is rather buggy and unoptimal. And hacky.